When the bride herself is an ace wedding planner AND the vice president of an ace wedding planning company (Percept Weddings) you know her destination Goa wedding is going to be off the charts! 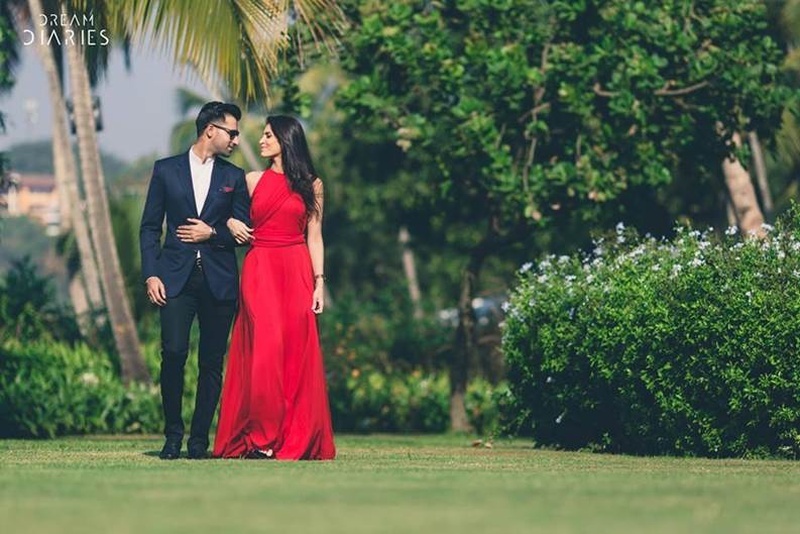 Khushi Singh and Samir Chaudhary (Founder & CEO of The Neon Tree) had a gorgeous destination wedding celebration at The Grand Hyatt, Goa with all the prettiness of a modern day wedding! This four day long wedding affair was brilliantly shot by Dream Diaries who captured every element of Khushi and Samir’s destination wedding in Goa beautifully! The bohemian mehndi décor details, the candid hugs, the dapper groom drinking a beer on his ghodi – all of it shot in its natural state, capturing the raw emotions felt in that very moment beautifully! This Grand Hyatt, Goa destination wedding was something dreams are made of – a mandap that stood bold and big, stunning bridal jewellery, and outfits of the bride and groom that will inspire many. Along with having traditional pheras and an intimate indoor haldi ceremony Khushi and Samir’s Grand Hyatt, Goa wedding also saw pool side brunches, beach cricket sessions and a Dusk to Dawn party – their destination wedding at The Grand Hyatt, Goa was a perfect amalgamation of traditional rituals and new-age contemporary chic design. Khushi and Sameer’s pre-wedding shoot amongst nature in Goa was all an exquisitely shot affair by Dream Diaries, with each picture capturing beautiful moments. Khushi wore a simple and elegant red gown while Samir looked dapper in a smart, well-tailored suit. Khushi inaugurated her mehndi day in a casual yellow day-dress that complimented the deep brown mehndi wonderfully. The event that took place after that was a colourful vision of fun and cheer. The venue was brilliantly decked up in appropriate décor by Percept Weddings, comprising of florally decorated signboards, food-carts, suspended colourful umbrellas and even swings. The outfit that Khushi donned at this event was breath-taking. She wore a gorgeous multi-coloured lehenga with embroidery that she paired with statement polki jewellery. Her better half chose to compliment his bride in an embroidered ensemble that was rather vibrant as well. What followed was a Sangeet night with all the usual dance, drama and dhamaka of a big fat Indian wedding. The event that took place at one of the luxurious ballrooms of Grand Hyatt, Goa had the entire wedding party having the time of their lives. Khushi celebrated the night in a deep-green and beige lehenga with heavy gold embroidery and zari work while Samir opted to wear a red silk kurta under a green jacket with all-over gold foil prints that matched his bride-to-be’s outfit. The wedding was celebrated with an infinite amount of pomp and splendour with high notes of red and yellow. Samir entered on a white horse with his baraatis and a beer bottle with all the contemporary swag a groom could have. He looked dashing in a muted gold sherwani which he paired with a green neckpiece. The bride looked traditionally gorgeous in a classic red lehenga that was heavily adorned with gold work. She accessorized with a stunning polki jewellery set that just stole the show. Every single detail at the wedding was immaculate. Look out for the elegant table settings and centrepieces, the colour co-ordinated bridesmaids and groomsmen outfits as well as the mandap installation that was a canopy rimmed with flowers. Out of all the gorgeous outfits that Khushi wore through her wedding days, her reception lehenga is what we loved the most. A beautiful muted-gold vision of glitter and sheer accompanied by emerald and gold jewellery, this beauty looked ravishing. Samir looked no less handsome in a sharp navy blue textured suit. The classy and elegant décor of the venue added a royal touch.